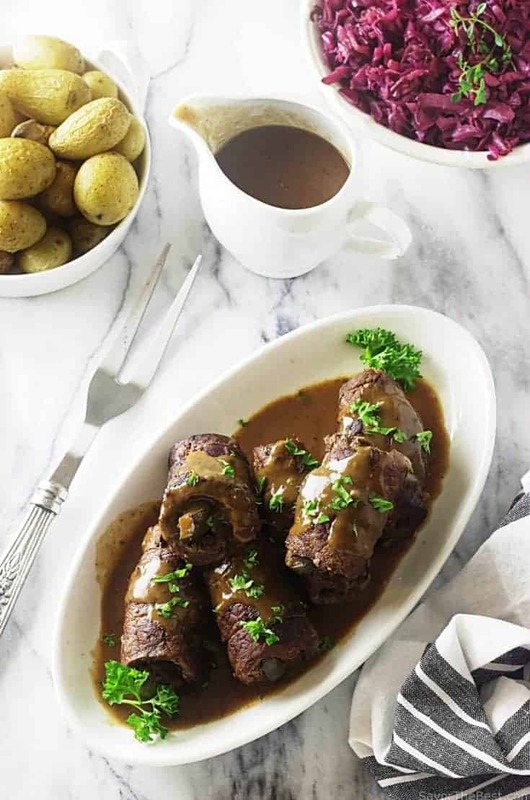 Rouladen, German Style Braised Beef Rolls is a classic recipe from Germany. These thin slices of beef are rolled up jelly-roll fashion with a simple stuffing of spicy German whole-grain mustard, flavorful bacon slices and surprisingly…a dill pickle. 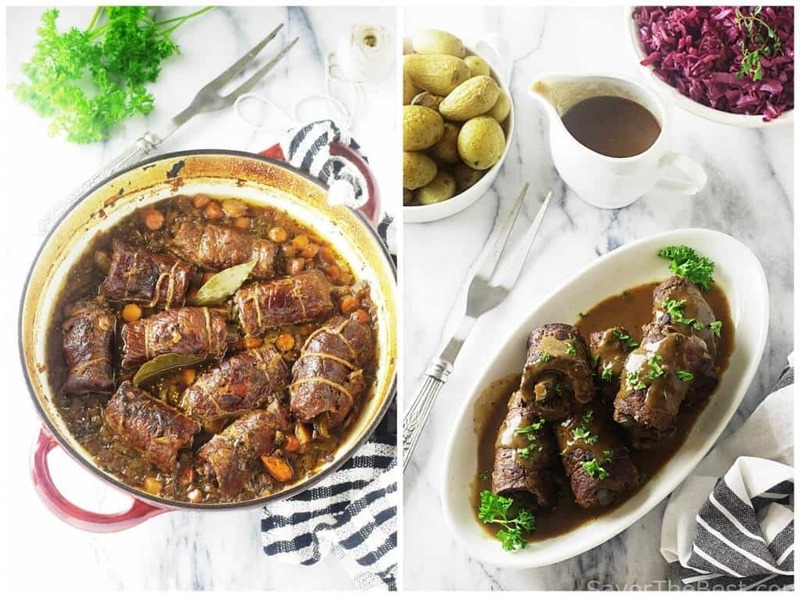 German Style Braised Beef Rolls! However odd that pickle sounds in this recipe, I can assure you that it is the ‘magical’ ingredient in this traditional German recipe. 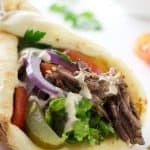 These beef rolls are not complicated to make and you probably have most of the ingredients right on hand in your kitchen. I used a 3-pound slab of London Broil that was 2 1/2 inches thick, 4 1/2 inches wide and about 7 or 8 inches long. I partially froze the meat which made the slicing into quarter-inch thick pieces much easier. Better yet would be to have the butcher make the slices for you. I trimmed the slices into rectangles and saved the scraps for another purpose. 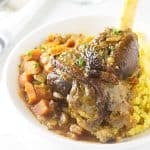 How Do These German Style Braised Beef Rolls Taste? Our 24-year old grandson, Aidan, was watching as I was preparing these little packages of beef with mustard, onions and bacon. When I added the dill pickle and started to roll he commented, “a dill pickle? that is just weird”. The stuffed beef rolls are slow-cooked in beef broth, wine and vegetables until they are tender. 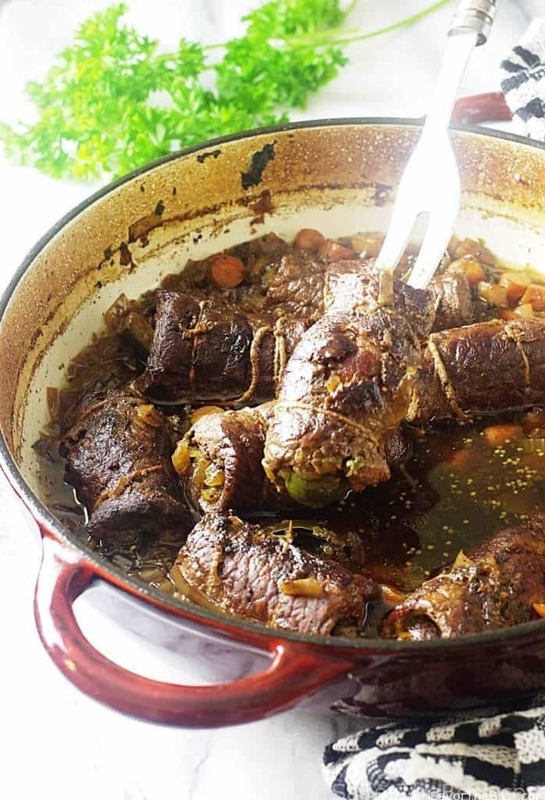 A sauce made from the cooking liquids intensifies these German-style braised beef rolls. To leave out serving the sauce would be equivalent to going to the fanciest of restaurants dressed in your finest, your hair perfectly done up, then leaving off your beautiful earrings. The sauce is the ‘finishing touch’ to this rich, savory dish. 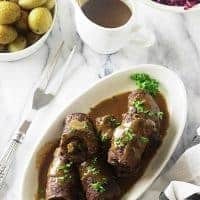 This recipe for German Style Braised Beef Rolls is one example of the wonderful flavors of Germany. A braised red cabbage-apple side dish traditionally accompanies these tender beef rolls along with a delicious savory wine based sauce. We included the red cabbage for a side dish but roasted the baby Yukon potatoes. My first taste of these German-style braised beef rolls was on a visit to Germany in 2009 and a 7-day cruise down the Rhine river. One night the menu included beef rolls. A wonderful beefy sauce covered the rolls. Sides of fluffy dumplings and a sweet-sour red cabbage-apple mix called Rotkohl mit Apfeln. Yum…. That was a memorable cruise! Each day of the trip our boat would dock at a different city along the river. We would spend the day walking along the cobblestone streets of charming villages, visiting castles and historic places. We tasted a wide range of German cuisine. Savory and sweet dishes and also sampled their beers and wines. It was like a huge smorgasbord of spicy sausages, meats, mustards, crusty pieces of bread and pretzels, creamy cheeses, and some wonderful desserts. And did I mention beer??? They have some of the world’s best beers! I love German cuisine! Have you ever tried their beef Sauerbraten? 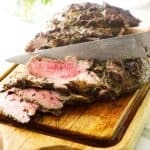 It is a beef roast marinated for several days in red wine, vinegar, spices and herbs. Then roasted and served with a most delicious gravy made with gingersnaps. 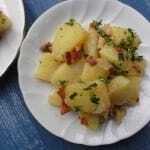 It is one of my favorite German recipes and you can get the recipe here. 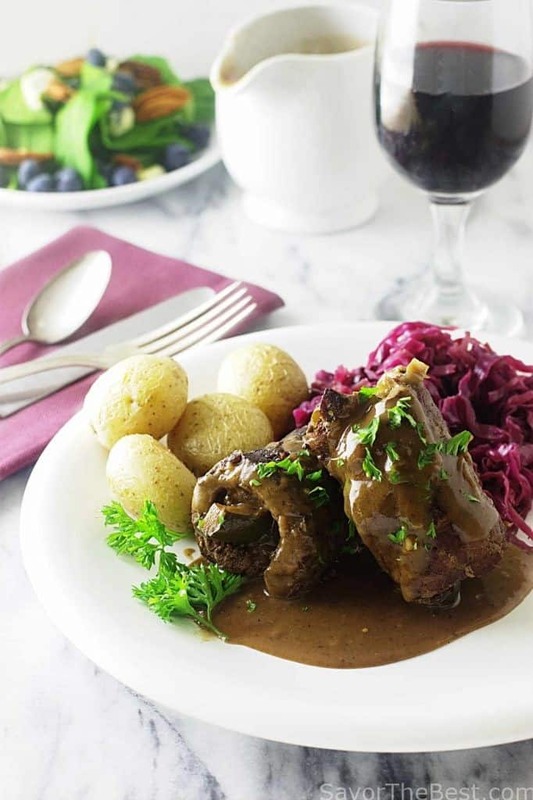 German Style Braised Beef Rolls sweet-sour red cabbage-apple mix called Rotkohl mit Apfeln. Yum…. Is German Cuisine Rich and Heavy? If you are thinking that German food is rich and heavy you are partly correct but they also have some of the best tasting foods in Europe! You can find a wide variety of fresh fruits and vegetables, creamy cheeses, crusty bread and lovely wines to enjoy that will balance out the ‘heavy and rich’ foods. It is all a matter of choices, just like we have here in America! Cut 16 pieces of kitchen twine at 6 or 7-inches each, reserve. Cut the steak into 8 rectangles of about 4-inches wide by about 6-inches long. 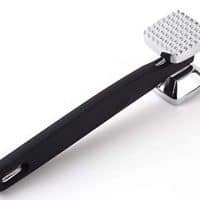 Use a meat pounder to flatten each piece of the meat to an even thickness. Working with one beef rectangle at a time, place a slice of beef on a work surface with the narrow end facing you. Spread the beef slice with a teaspoon of mustard and sprinkle with 2 teaspoons of the chopped onions. Add one slice of bacon down the center. Add a dill pickle stick across the narrow end closest to you, and begin rolling the meat like a jelly-roll into a firm cylinder. Using two pieces of the prepared kitchen twine, tie each end about 1/2-inch from each end. Trim the excess twine close to the knot and set the prepared beef roll aside on a plate. Proceed with rolling the remaining slices of beef. 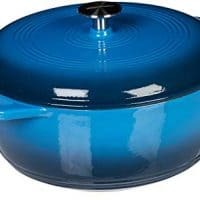 Add the oil to a heavy-bottomed skillet or a Dutch oven set over moderate heat and when it has heated but not smoking, add half of the beef rolls and brown on all sides. Adjust the heat as needed to prevent them from burning. Transfer the browned rolls to a platter and brown the remaining batch of beef rolls, transferring as they brown. Pour the beef broth and wine into the skillet, scraping up the brown bits stuck on the bottom. Add the leeks, parsnip, carrots, celery, half of the parsley, bay leaves and any/if the chopped onions that may be left over. Add the beef rolls, turning them to moisten. They should be almost covered in the liquid. Bring to a boil, cover the pot and transfer to the middle rack of the oven, cook for 1 hour. Turn the beef rollsl half-way through the cooking period. Transfer the pot from the oven and remove the beef rolls to a platter and cover with foil to keep warm while making the sauce. Over medium-low heat, melt the butter in the same pot and sprinkle in the flour, stirring constantly until the flour turns light brown. Gradually add the reserved 2 cups of cooking liquid, whisking until the sauce is smooth and slightly thickened. Taste and adjust seasoning if needed. Return the beef rolls to the pot, turning them to coat with the sauce. Simmer over low heat just long enough to heat the rolls, about 5 minutes. Remove the beef rolls to a serving platter. Pour the sauce into a small serving pitcher, pour half of the sauce over the rolls and sprinkle with the remaining chopped parsley. Pass the pitcher of sauce to guests. Serve with red cabbage and roasted potatoes. I used a 3-pound slab of London Broil that was 2 1/2 inches thick, 4 1/2 inches wide and about 8 inches long. Ask the butcher to slice the steak into 1/4-inch slices. Any remaining portions of the beef can be reserved for another use. Seriously good looking Rouladen you have there. The pictures, with the gravy, cabbage and spuds are to die for! Thanks for the recipe and pictures. Superb. Wow, I have never heard of these before, but they literally have every ingredient that I love! And why don’t we have pickles more often in our recipes here? Pickles are the best! Totally bookmarking these to try! My mom used to make a similar looking dish and it was so good! I can only imagine how delicious these beef rolls are! And that sauce! Yummo! 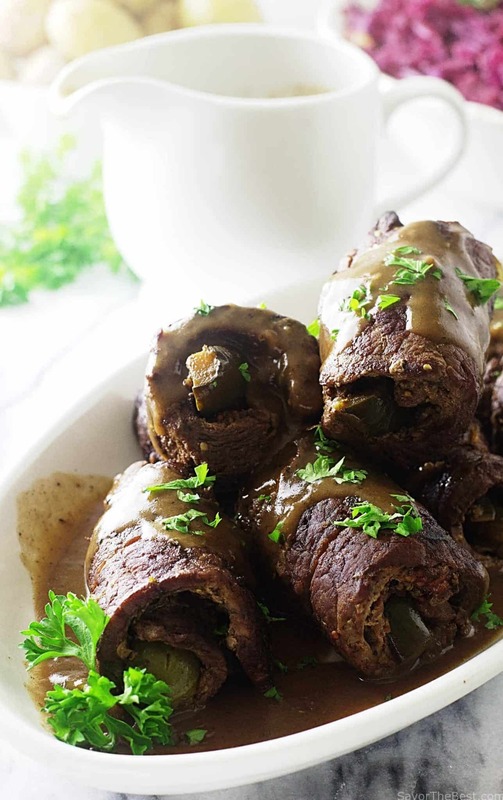 These beef rolls look incredible and perfect for cooler weather! I love the look of these! I think this kind of dish used to be popular here when I was a kid, but for some reason it fell out of fashion – I hate that idea of fashion in food though, if something is tasty, why stop enjoying it? Yours looks amazing! Wow, these beef rolls will make a perfect dinner! Germans do know how to cook their meat. Thanks for the recipe! Hi, Igor…..I totally agree with you, German cuisine is one of my favorites. This dish is delicious, hope you try it. Such a creative idea!! 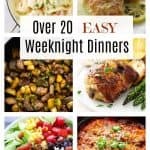 I love when bloggers post novel + unique recipe ideas like this one. Thanks so much for sharing! 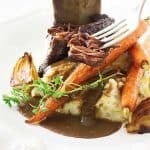 These braised beef rolls look perfectly rustic and great for a family roast. I usually like my beef cooked medium, but I would imagine these would be well done. Does the beef stay tender with this cooking method? If so I’ll have to give it a try! Oh my, these beef rolls look so tender and scrumptious! Must try them! Love that you served them with baby potatoes, red cabbage, and a glass of red wine. Our kind of meal! The husband would LOVE this!! 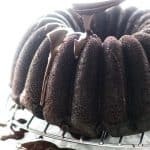 I love all the flavors you use with this– and awesome photos! Yummy looking! And a bit different from what I usually see for German food. I love the addition of the dill pickle into the rolls. That doesn’t even sound odd to me! I think the flavor of the pickle would balance the other flavors in the dish. Hi, Annemarie: You are so right, the pickle is the secret…it is perfect in this recipe. I’ve never had this before, but it sounds so much like my beef bourguignon, I know I’d love it! Hi, Lisa, You will have to make this and tell me how it compares to your beef bourguignon, which I am unfamiliar with. Hi, Sue! I hope you find them as good as the memories of your grandfather’s beef rolls. So many thanks for the share on facebook!